Claflin College. —. . (Front) . 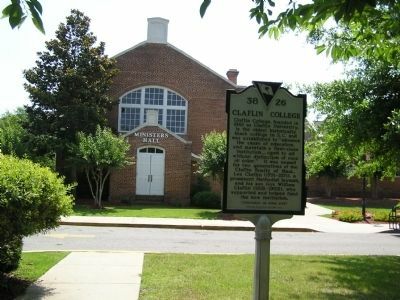 Claflin College, founded in 1869 as Claflin University, is the oldest historically black college in S.C. and was established to "advance the cause of education, and maintain a first-class institution ... open to all without distinction of race or color." 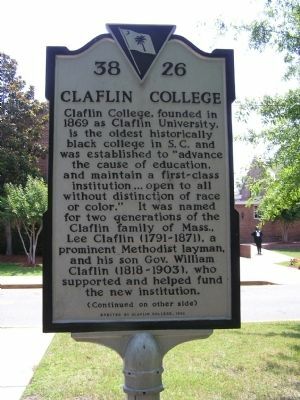 It was named for two generations of the Claflin family of Mass., Lee Claflin (1791-1871), a prominent Methodist layman, and his son Gov. William Claflin (1818-1903), who supported and helped fund the new institution. 51.277′ W. Marker is in Orangeburg, South Carolina, in Orangeburg County. Marker is on Claflin Circle, on the right when traveling east. Touch for map. On the grounds of Claflin College, inside the front gate, just off of Magnolia Street. Marker is in this post office area: Orangeburg SC 29115, United States of America. Touch for directions. Other nearby markers. At least 8 other markers are within walking distance of this marker. Episcopal Church of the Redeemer and Graveyard (about 400 feet away, measured in a direct line); South Carolina State University (about 700 feet away); Trinity United Methodist Church (about 700 feet away); The Orangeburg Massacre (approx. 0.2 miles away); Church of the Redeemer (approx. 0.4 miles away); Judge Glover's Home (approx. 0.4 miles away); Court House Square (approx. 0.7 miles away); Orangeburg Confederate Memorial (approx. 0.7 miles away). Touch for a list and map of all markers in Orangeburg. who provided a large part of the funds to purchase the campus. — Submitted September 25, 2011, by Anna Inbody of Columbia, South Carolina. More. 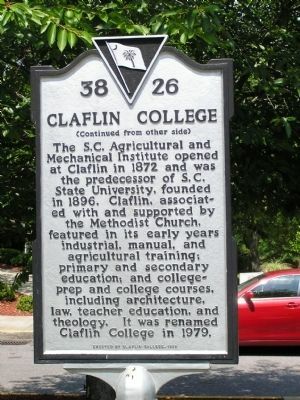 Search the internet for Claflin College. Credits. This page was last revised on June 16, 2016. This page originally submitted on September 25, 2011, by Anna Inbody of Columbia, South Carolina. This page has been viewed 559 times since then and 7 times this year. Photos: 1, 2, 3. submitted on September 25, 2011, by Anna Inbody of Columbia, South Carolina. • Bill Pfingsten was the editor who published this page.